The Killdeer Plover is one of the many birds our family tends to call sandpipers. These shorebirds are recognizable for their distinctive neck bands and the way they run across the ground. There’s something charming about the way they sprint and stop every few feet; checking their status and observing the world around them. Killdeer’s build their nests primarily on the open ground. To protect their eggs and hatchlings, they pretend to have a broken wing and hope to lure predators away from their offspring. When faced with larger animals, like cows or horses, they fluff up their feathers and put their tails over their heads in hopes of creating something the larger animal would rather not tangle with. The killdeer plover nest in this drawing looks quite thin. Even after the eggs are laid, the birds continue building their nest of dried grasses and pebbles. The eggs themselves provide a bit of their own camouflage, with colorings that make them appear to be pebbles. Ironically, now that we live far from the coastal regions of North Carolina, we still see these charming birds. They are considered shorebirds but they can often be found far from water. If you are as fascinated by shorebirds as we are, we have a whole section dedicated to vintage shorebirds. 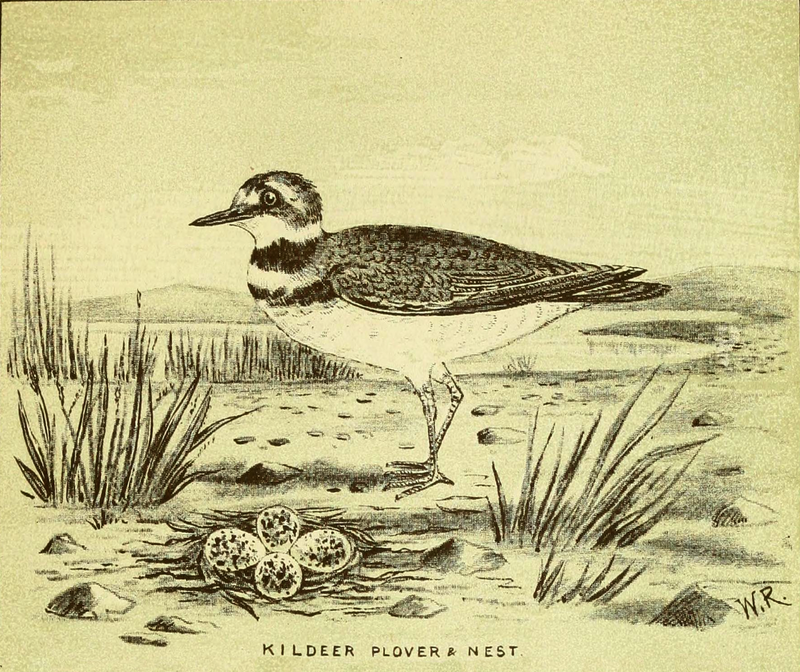 This killdeer plover nest drawing is one of several wonderful bird illustrations by Walter Raine (1861-1934). He published Bird-Nesting in North-West Canada in 1892 and drew all of his own illustrations. The image shown above is slightly smaller to fit the design of Reusable Art. Please click on the killdeer plover nest drawing to view and download the full-sized version.